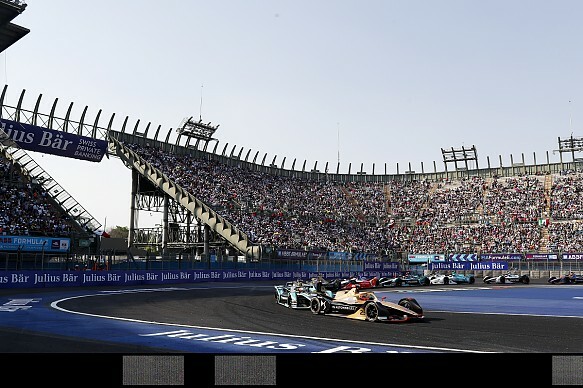 Nelson Piquet Jr and Jean-Eric Vergne disagree on the cause of their enormous accident in the Mexico City ABB Formula E Championship race, in which the Jaguar driver went airborne. The pair were scrapping over eighth place on lap three of Saturday's race when Piquet attacked Vergne on the approach to the final chicane. 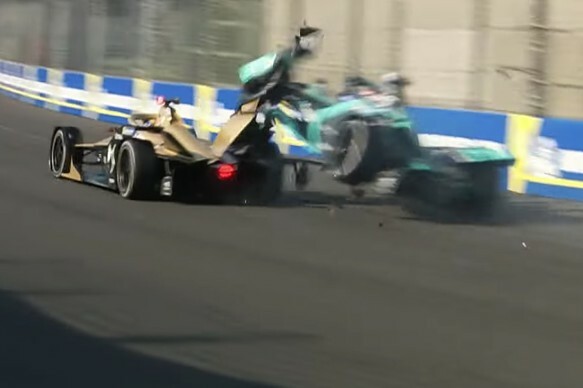 Vergne moved across to defend his position and as they approached the corner, Piquet slammed into the DS Techeetah driver's right-rear wheel and shot into the air. He collected BMW Andretti driver Alexander Sims when he landed and then hit the barrier beyond the chicane where his wrecked car came to a stop. Piquet told Autosport that "JEV seemed like he was saving energy a lot by that point of the race already. "I even thought he had a problem so I went to the inside, he started closing the door and I was ready to really commit to the corner and brake on the inside and pass. "But then he kind of regened pretty early over there. "When it happened, straight away I was like 'for sure he closed the door way too early'. "[But] I looked at the video and I'm not going to blame 100%. "Yeah it was aggressive, I was committing to the corner, but when you start defending you expect the guy to brake deep, he's not going to brake in the point where he's coasting or on a saving lap. "So, that caught me by surprise obviously, it was closing the door and I thought he'd brake deeper and he braked way too early. When I hit him I was still accelerating, basically." The incident caused the race to be suspended, which meant Techeetah could fix the right-rear wing, right-rear wheel, sidepod and front wing damage that Vergne's car had incurred. Explaining his view of the incident to Autosport, Vergne said: "I closed the door and I kept my line, I did nothing wrong and I braked on the normal point and he just went flying over me. "I don't know what he thought - maybe he didn't see the corner because he was completely on the inside. He completely misjudged the braking. "I don't want to talk bad about Nelson - I'm just happy he's OK because it was a big crash. But it was unnecessary." Vergne ran in the lower reaches of the top 10 for much of the restarted race, but ended up 13th after a clash with Mitch Evans dropped him down the order. Sims also took the restart and finished 14th, but said that his BMW team only got him back out with "15-20 seconds" to spare. "The mechanics did an amazing job to get the car repaired in time," he told Autosport. "Then it was really positive, really good fun. "The car wasn't all pointing in the right direction but it was still driveable and to fight with everyone else and to have to rag it and learn lots fighting was good."